Only showing entries about chottu from Pintu's Firsts. View entries about chottu from all Travellerspoint blogs. Now where did I get to? 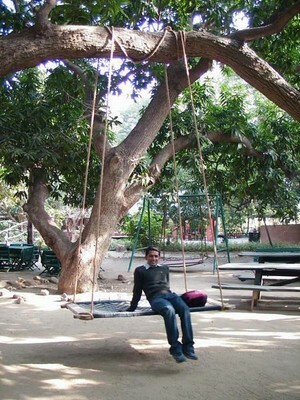 Oh yes, we'd arrived to a very warm welcome at the Maharani Bagh Orchard Retreat. Perhaps I should first tell you a bit about this hotel. 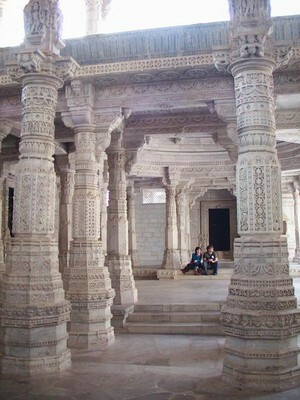 It's located near Ranakpur, a famous Jain pilgrimage site, and is owned by the royal family of Jodhpur. The garden ("bagh") and orchards were laid out by the Maharani of Jodhpur in the 19th century and the cottages in the grounds were converted to hotel accommodation in more recent times. Since our visit in 1997, a new accommodation wing has been added and an indoor restaurant and larger swimming pool are now nearing completion. None of the new hotels in the area can boast of century-old gardens to compare with those here, nor with its authentic atmosphere; it is truly a haven of tranquility. My morning started with a visit from an ageing masseur sent by Khuman. For 100 Rupees (about £1.25) - I later learnt that he would probably have been quite happy with 25 Rupees! - I was oiled and battered for half an hour. It's quite cool here until the sun comes up so, although he started the massage on the patio, I soon retreated indoors. During the day, the temperature here gets up to around 30 degrees C but, at night, it drops like a stone and everyone wraps up warm. While I had breakfast, Jai Singh, our driver, went off to collect Pintu from his parents' home, then we set off to Pintu's former secondary school just ten minutes' drive away. This was the school at which he was awarded his gold medal. The Principal was delighted to meet us and proudly showed us around, Pintu being greeted by several teachers who were still there from his days. The 500 or so children, all in smart uniform, were inquisitive but remained focussed on their studies in the small classrooms grouped around a central courtyard. 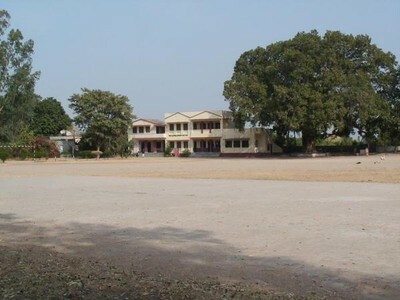 There were now nine computers in the school (there were only two when Pintu was here), as well as a basically-equipped science room, and a sports hall. Simple but thorough seemed to be the order of the day here. 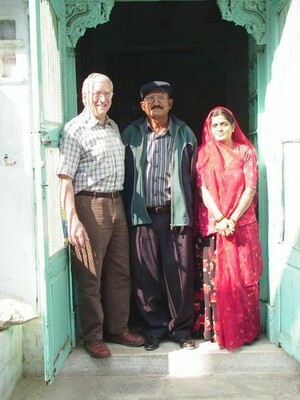 This school had certainly provided Pintu with an excellent start to his education. 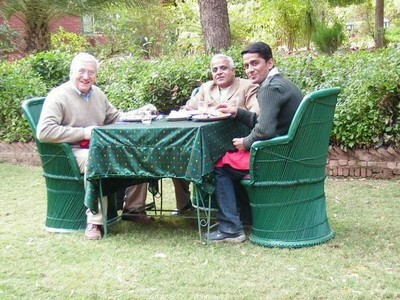 We enjoyed a delicious lunch with Khuman at the hotel, before he accompanied us to the Jain temples at Ranakpur. The immediate surroundings of the temple complex had been improved since my last visit, but the wedding-cake buildings remain unchanged. The calm, white marble interior with its 1,444 intricately-carved columns (just one of them not quite vertical - to prove that not everything in this world is perfect) could not change. Khuman, a revered and important man in this region, was greeted affectionately by the head priest. I was interested to learn that, although both Khuman and Pintu are Hindu, they pay their respects on entering this or any other religion's holy places because, while they worship many gods, they believe there is only one Almighty. A short drive afterwards brought us to a viewpoint in the Kumbalgargh Reserve, devoid of tourists. At dusk, leopards are sometimes seen crossing the road here. We saw just a few monkeys, peacocks, and colourful butterflies. On our return to the Maharani Bagh, Khuman and his gardener accompanied us on a walk through the eighty acres of woodland belonging to the hotel. In clearings among the arid woods and scrub, small orchards of citrus trees had been planted, carefully tended by the staff. Our quest, however, was the elusive Blue Bull antelope. The gardener was sent off to locate them and he ensured we were not disappointed. While we remained still and silent, a small herd of around twenty of these shy antelope was flushed from cover, mostly does with young then, near the rear, a large stag with dark blue flanks. This unusual excursion was followed by drinks and copious snacks, then dinner by the campfire until late into the night. The next morning, another pummelling by the elderly masseur got the day off to an early start - largely because he arrived an hour earlier than I’d asked him to! It was just after eight o’clock and, as there was a distinct chill in the air at such an early hour, I had my massage indoors - prostrate on the marble floor with a fan heater turned onto its highest setting - at least, until it overloaded the main fuse and the room was plunged into cold darkness. After breakfast in my room, it was sad to say goodbye to Khuman and all the staff who had gathered by the Maharani Bagh’s shaded entrance - a goodbye as warm as the welcome. My suitcase now contained an elephant - a heavy brass one, a generous gift from my dear friend Khuman. I may have to shed a few things from the case to avoid excess baggage charges on the flight home! We collected Pintu from his parents’ home and, after taking some photos in the doorway, his mother, Gajendra, placed a bindi on our foreheads, a traditional third eye made with vermilion, finely-powdered red mercuric sulphide, representing strength and love. We were also given a small piece of sweetmeat to wish us well on our journey. Gajendra really is a lovely woman, said to be the most beautiful of the seven sisters. She understands a little English, although Pintu had to translate my thanks to her for the loan of her son! The long return drive to Jaipur was tedious and interrupted only by a stop at a roadside restaurant to eat a packed lunch thoughtfully provided by Khuman. We’d planned to do this journey tomorrow, but it would have meant a very early start in order to catch our onward overnight train to Bombay and Jai Singh was uneasy because any delay along the way could result in us missing the train and he didn't want to be responsible for that! 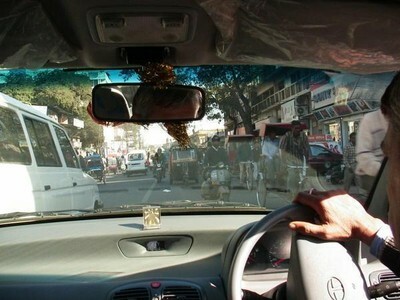 So, we stayed an extra night in Jaipur. On Jai’s recommendation we booked into the Rajasthan Palace Hotel. It was grubby, poorly maintained, and far from being a palace. It was convenient though for Chottu and Montu to meet us again, and we enjoyed their company for an hour or two before retiring to our very basic accommodation. Four statues - L to R: Chottu, me, Pintu and Montu in the garden of the Rajasthan Palace Hotel. I know it was the garden because there was a big sign saying "Garden". Thought for the day: A mental disorder is not essential to drive in India, but it helps. In most Indian states, motorbike drivers have to wear crash helmets. The driver’s wife, precariously riding side saddle on the pillion, and the two kids - one astride behind mum and the other between dad’s legs at the front - don’t have to, and invariably don’t. Liberal use of the horn to warn every vehicle in the vicinity that you are about to collide with them is obligatory. Every truck has ‘Horn Please’ written in big colourful letters on the tailboard. Some have other legends too, like “Trust in God” (or “Tourist in God” as we saw on one truck). The only rule of the road is: there are no rules! No-one has right of way. If you’re there one centimetre ahead of the next vehicle, you win and get to go first. Sometimes if you’re one centimetre behind, you also get to go first! Cows, elephants, and pedestrians wandering along in any lane usually carry on regardless. Overtaking is usual on blind bends or whenever a vehicle is seen to be coming towards you - or, indeed, whenever you feel like overtaking. Just keep sounding the horn! Surprisingly, we haven’t seen any accidents on the roads this week - but there have been many near misses! We’ve also only seen a couple of road kills in that time - dogs tend to sleep on the warm roads at night, and clearly a few don’t wake up in time!